worthy companies. Sponsored by Farm Credit Canada, the prestigious event attracted over 400 guests as part of the annual SIAL Canada exhibition. The Canada Brand Image award goes each year to a Canadian agri-food company which successfully positions its products on the international market by proudly exhibiting our country’s brand and enhancing Canada’s reputation as a world-class provider of agri-food products and services. 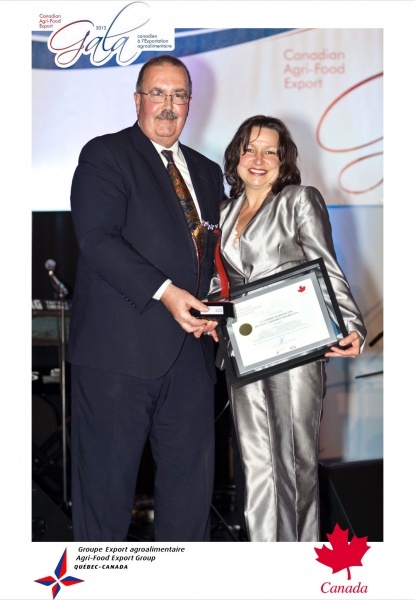 Mrs Lisa Nadeau, President of the company receives the prize from Mr.Claude Carrière, Deputy Minister, Agriculture and Agri-Food Canada during the 6th Canadian Agri-Food Export Gala.